That's how many days until I leave. I'm off to Pittsburgh a few days before Market to have some fun and do some "visiting". I figure if it isn't done by then, it isn't going to get done by Market anyway. And yes, I've had to accept that a few of the quilts I planned on having ready for Market aren't going to get to make the trip. A couple of things to clarify from the last post... about those pincushions. While there are just two different designs in the pattern, I wanted to make a couple of each. Partly to show some of the possible color combinations of each but mostly because I love making them. They'll get photographed next week so that cover may actually be ready for Pittsburgh! As for the bindings, I think you know that I love doing those. I don't much like the "sewing the binding onto the quilt top" part of it but I love the stitching down the binding part. Because of the different battings I'd used in the three different quilts, I had to vary the sizes of the stips I cut. I wound up using strips measuring 1 3/4" wide, 1 7/8" wide and 2". While I was sewing today ~ on a new Schnibble that will be called "Picnic" ~ I happened to see one of my very first quilts and I thought you'd get a laugh out of seeing some of my "early work". The first quilt I made was a Sun & Shadow using Blanche and Helen Young's book, and this amazing new tool called a "rotary cutter". They were brand new on the market and I think everyone was a little afraid of them. It didn't help much that the "quilting traditionalists" seemed bent on sharing horror stories of gruesome rotary-cutter injuries in an effort to keep everyone from trying this scandalous new invention. While sewing strips in class, everyone else was making a lovely quilt. I was making a windsock. The funny thing about it is that I machine-quilted it myself ~ which was truly scandalous behavior to the quilting traditionalists of Dallas, Texas in 1984. And I quilted it in red thread! After the smashing success of this first quilt, I figured I could make anything. So what if I stitched this quilt to the living room carpet while basting it for quilting... everything was a learning experience! My second quilt was one of those Roman Stripes quilts that were all the rage at the time. But instead of using black and traditional Amish colors, I used royal blue and all these sherbert-like pastels. It was really cool ~ and no, I don't have it any more. I gave that one away. Just one problem... I didn't want to have to applique that little square into the corner of the plain square so I figured out I could piece it. But it seems like I compressed it a bit and this is kind of a Triple Chain that the Irish want nothing to do with. 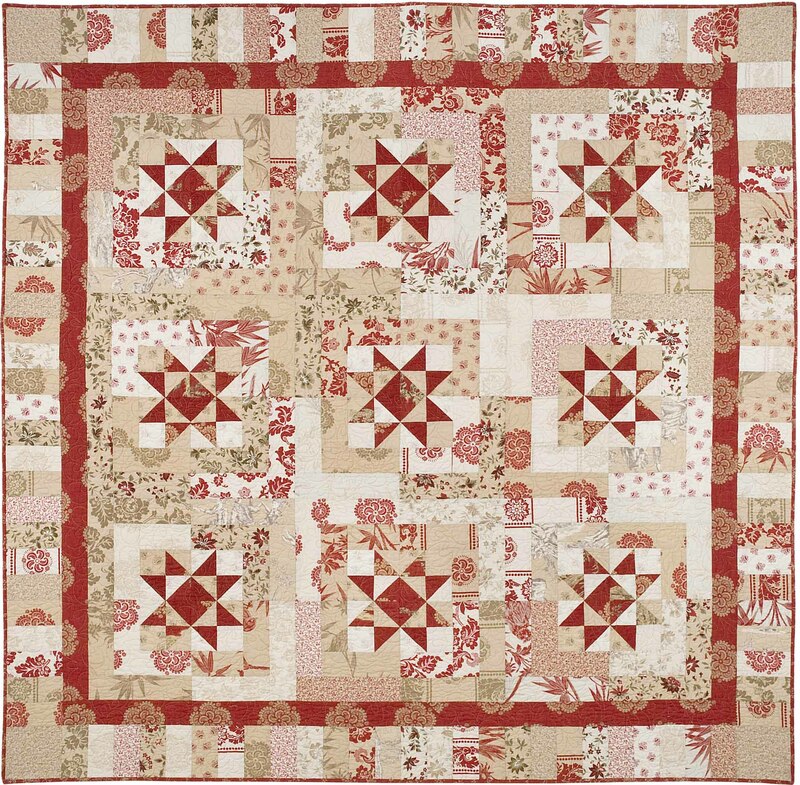 And this quilt has rounded corners because I didn't know how to do a mitered binding and I didn't care much for that log-cabin sort of corner that the lady at the quilt shop recommended. And since the resident shop "expert" did really awful mitered bindings ~ based on what I had seen at the quilt show, I didn't think her bindings were all that "expert" ~ I decided to go for something easier. A curved corner! Since I had obviously mastered strip piecing, I figured I was ready for a challenge for my fourth quilt. I had the book ~ also by Blanche and Helen Young ~ I had my rotary cutter, and I knew math! What could go wrong? This started when I saw an antique quilt in a fancy quilt boutique in Houston. It was priced at $1000.00, and it wasn't even in perfect condition. One side of the quilt was completely faded out ~ probably due to being on a bed next to a sunny window. But since I could sew... I could make that! Carol spread the quilt out on the floor and after some smoothing... lots of smoothing... more smoothing... a couple of "hhhmmmms...", she finally broached the subject. The border didn't really want to lay flat... it appeared that there was more border length than necessary on two sides. When the corners ~ six borders, all perfectly mitered, thank you very much! ~ were aligned as they should be, one of the sides was perfect. A second side was pretty good ~ good enough that it wouldn't be a problem to quilt. The third side... a bit of a peak... maybe 1" of extra fabric. Problematic... but not truly tragic. The fourth side... huge problem. About 3" of extra fabric. Ooops... I'm guessing this might be an example of why just sewing on borders and whacking them off is a bad idea. But I can fix this! I know how! I can rebuild this quilt... I have the skills... I have the technology! If you want a true lesson in humility ~ and an education in just how much you've learned over the years ~ take apart an early quilt and look at some of the things you did. I'm guessing I cut those setting squares and triangles with scissors as some of the edges looked a little... well, choppy. Y-seams... sch-y seams... thankfully, I've gotten a bit better at doing those. As for the setting squares and triangles... you should have seen Carol doing a Twister-thing on my quilt top trying to get all of them flat at the same time. But here's where a super-talented and awesomely-skilled quilter can make you look really, really good. Carol said she would do what she could which was fine from me because I really just wanted it quilted. When Carol called me a week later to tell me the quilt was done, she said she thought I would be pleased. I didn't believe it until I saw it with my own eyes ~ flat as a pancake. It couldn't have been any more flat if one of those street-paver things had rolled over it. So there you have it... and I still haven't made a perfect quilt. Maybe someday... but probably not in the next fifteen days. Oh my goodness, I LOVED this post. Loved it! Love seeing your first quilts, love the stories behind them, and especially loved knowing that I'm not the only one who makes completely imperfect quilts. Only thing I didn't love- 16 days! Are you sure?? Relax and have a great trip. Great story of your quilting journey! what a great herstory lesson! your first quilt brought back some memeories (for me, at least) ... and i love that you are NOT a quilting snob. Loved your stories of your first quilts - and your rebelliousness. LOL I have one of quilts with the extra fabric on the border - I quilted it any way (with all of the puckers) and we use it as a picnic quilt. Lesson learned, however! Oh, it's so much fun to hear about your early quilts, Carrie. Loved the "windsock" analogy! I also love that you persevered with your star quilt. That's the kind that would have been balled up in the closet for me. It looks beautiful and FLAT! On another note to you - I recently picked up those really cute silicone cupcake bakers from W/S. I have heard horror stories of the silicone bakers, but I have to tell you I was thrilled with them!!! Please pass that one on - I may have to get a second set!! Call me crazy, but I think even your first quilts are lovely. And perfection is so over-rated, don't you think? The "windsock" quilt is definitely a tad bright, but still pretty and bold. Good luck at Quilt Market! I love the stories about your early quilts...thanks so much for sharing! Carrie you make me smile!!! I appreciate your sharing your quilting beginnings. My "first" quilt sits in some box somewhere, unfinished. It is good for us to look back and see how we have grown in our skills and color choices; but I like your early quilts too! Hmmm...Carrie, I don't know what month and year you were born but I will suffice to say I turned 59 a little over a week ago. The reason I mention this is because of your color choices for the first quilt in your post. I drive my sister in law crazy when we go to the quilt shops because I gravitate to bright...I mean bright colors while she leans to the the more country and elegant type fabrics. Ah...variety, that's what makes the world go round. I haven't made my 'bright' quilt yet, it is one of my projects in waiting but the colors are pretty remenicent of your lovely bright quilt. You had me almost falling off the chair with your comments about the resident experts in the quilt shops and the poor work they did on some things. I'm tellin ya' the first quilt I made, I think I told you before that I flew by the seat of my pants on that one because even though I was brand new to quilting, I had made clothing for years and the way they told us to miter corners...well, I can't begin to describe the instructions she was giving us so bizarre they were so I'm speechless on that subject. I just leaned over and told my sis in law to wait to do hers and the next day we got together and I showed her how to do a mitered corner and they turned out perfectly. I did however have other issues with my quilt. No one told me to 'press', not iron. That little abscent tip cost me about $50 in new fabric because I had distorted one side of the quilt center design. Thing is, the instructor stood and talked to me while I was steam ironing my blocks!!! Hmmmm....She must work on commision. Ah well, I loved your stories and they just ring so true. Especially the aspirations of doing my own quilting ***insert crazed laughter here***. I won't even go there. My piecing always receives high marks and my quilts are very flat and square (NOW) so I will settle for what I can. Okay, on to why I actually logged on today. I just picked up an issue of American Patchwork & Quilting, low and behold, there is your quilt on the cover. It is to die for...I adore it and have already pulled out my civil war print fat quarters (might need a few more) and background fabric and decided it is exactly the pattern I want to use them in. I've been looking for the right pattern for months so I owe you a huge thank you and also congrats on the magazine cover. It truly is beautiful. I know I'm a little late getting the magazine but I saw the cover picture online and immediately went to the store to get it. I didn't know it was your quilt till I picked up the magazine...woo hoo!!! Well, have a wonderful time 'visiting' prior to Market and if you do any shopping, would you fondle a few of the scrumptious things you see for me? Possibly drool a bit on some and tell them it's from me with love!!! OH how I would love to be there. Hope you have a great trip and a delightful time. Give Miss Rosie a scratch for me and thanks again for another beautiful pattern. Well, Carrie, I popped in to ask a question, I just know you have sooooo much time to answer them, and I thought you might be bored and need something to do...ya, right!! !Okay...I didn't know I was going to stumble into a giveaway! The sneak peak at the Schnibbles and that beautiful hat box with 'mystery' pin cushions was a delight to see. Thank you. As for snacks, that's a tough one for me because I tend to not snack when I sew but if I do I try to choose something salty as that is also my preference. There are always yogurt or chocolate covered pretzels...there I get salty and sweet and they are small enough I don't get messy fingers. Lately though, I take a bowl of ice cold grapes down and keep in reach. Very refreshing. And of course the ever present Cola of choice. As for music...like Julia, I listen to audio books, Music doesn't make me nervous, but it breaks my concentration cause I start singing and clapping, and snapping and finally dancing...not a pretty site, especially if it is a cane day. If I do put music on it has to be very mellow. I love many of Sarah McLachlan's songs, "The Answer" being my favorite just now. But I would probably listen to one of my woodland nature sounds CD's that have very soft mellow piano music in the background. Hmmm...I sound like a very boring person. Ah, that question I had for you...when you do have a spare minute, maybe in a year or two, I have a dear friend that had 2 brain aneurisms burst (amazingly she survived) but has a third that needs operated on and is waiting to be well enough to survive the third surgery. She is paralyzed on the right side and has lost some of her speech but has complete cognitive memory and recognized me today. She doesn't know yet as they can't risk telling her that her hubby (my hubbys best friend of 40 years) was diagnosed Friday with testicular cancer. We spent the day with them today and I really want to make her a quilt to have over her legs as they are cold all the time in the hospital. I'm not a very fast sewer because of the health issues but I get the job done. Can you suggest a pattern that works up fast but still has some 'flash' in it (I don't want to just do squares and have no problem matching points). I'm able to sew for 3 or 4 hours a day max, and I'm just a little lost right now on this endeavor, I've looked at patterns till I'm cross eyed. Anyway...now I've put in my two cents and much more so I'll just shut up except for one thing. Good luck to everyone in this giveaway!!! OH by the way...I love all the Scnibbles but Good Fortune has to be my all time fav. But Hot Cross is wayyyyy fun. Didn't comment on this (bad karen) but it was a good post and it stuck with me so at leehaven.com yesterday I was inspired to post from it. I referred back to this one. Just wanted to let you know. *karendianne. How did I miss this post? You are so darn brave to show your early quilting efforts! I must do that too, if I can get up the nerve. You should see my first sampler quilt. Gold, rust and brown. Lisa just died when I showed it to her. She did say my color sense has improved though!